This year’s autumn is turning out to be a long, drawn-out affair – less rocket, more damp squib. But whatever the weather, a handful of plants are guaranteed to put on a firework display. 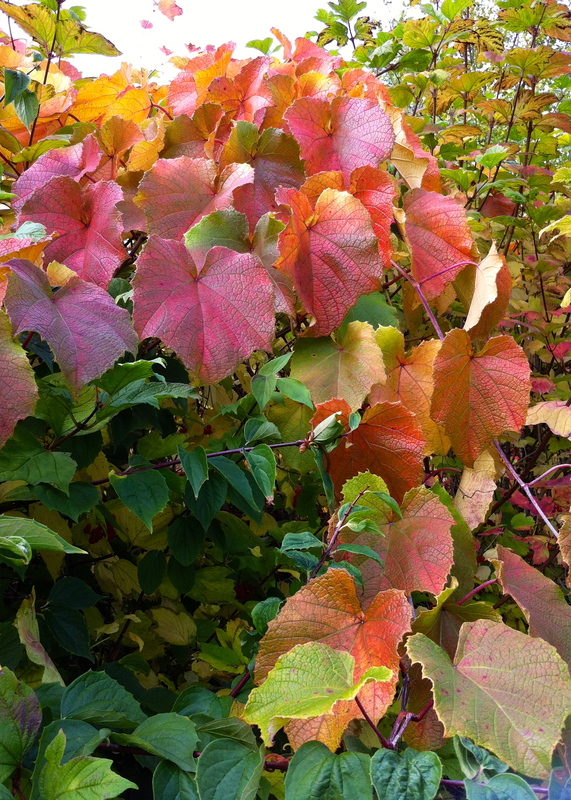 Vitis coignetiae, the crimson glory vine, is among them, a sure-fire hit when it comes to blazing colour. You’ll need a bit of space to get the best out of this vigorous vine, but it’s perfect for sending scrambling through large trees and shrubs, especially evergreens that will provide a backdrop for the leaves as they change colour. The textural possibilities are endless – imagine the contrast with blue spruce (Picea pungens), lush tree ferns or a simple red-brick wall. Alas, one can’t look forward to a crop of grapes, as the berries of Vitis coignetiae are small and bitter, but then, one can’t have everything! Well, the vitis was taken with my iPhone, most other pics with a Canon 450D. I keep meaning to upgrade, but can’t make a decision!